The transmembrane-aminopeptidase gene (Taqpep for short) is the first gene found to influence the coat patterns of mammals. 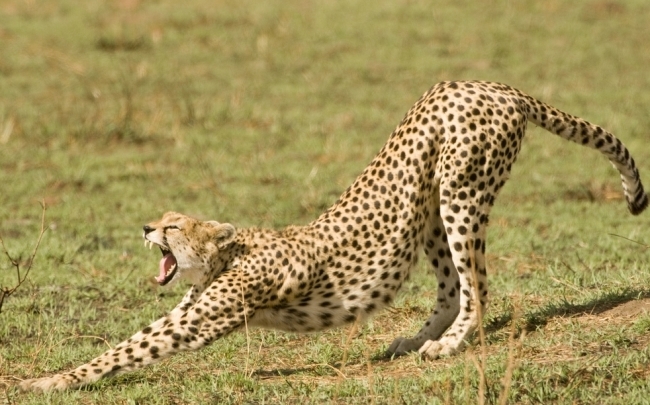 It is a recessive that creates the phenotype when gained from each parent to cause cheetah's spots to coalesce into the characteristic king cheetah stripes or blotches. Christopher B. Kaelin, Xiao Xu, et al from a range of American and African universities have produced an interesting paper, published in the journal Science, to investigate the coat genetics of all cat species, with reference to this blotched patterning from both tabby cats and king cheetahs. Above: (Left) King cheetah sightings have been restricted to a small (grey-colored) region that includes the Northeast corner of South Africa and parts of Botswana and Zimbawe. 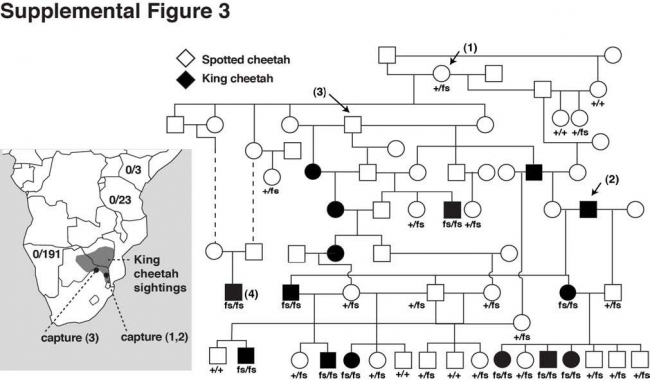 (Right) The K977Nfs110 mutation is completely linked to the king cheetah pattern under a model of autosomal recessive inheritance with complete penetrance. Genotype results are shown for 32 captive animals from the DeWildt pedigree (non-mutant, +, or mutant, fs), and reveal that the mutation was introduced into the DeWildt pedigree by 3 captured animals (1-3). The animal from Northern California (4) is also derived from the DeWildt pedigree; dashed lines indicate 5 generations in which no king cheetahs were observed. The Taqpep gene also transmogrifies domestic cat coats into a swirled, striped appearance and influences many members of the Felidae family to create diverse species characteristics and those varieties we all admire in our domestic species. 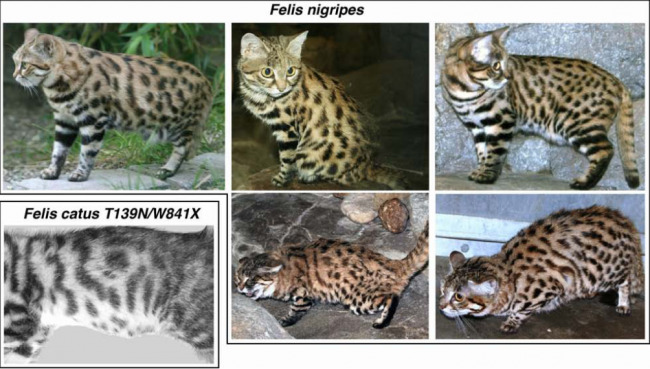 The tabby cat we all know got its spotting pattern from this gene.